Hey everybody! Just wanted to share a new layout that went up in the Garden over at Two Peas In A Bucket today. 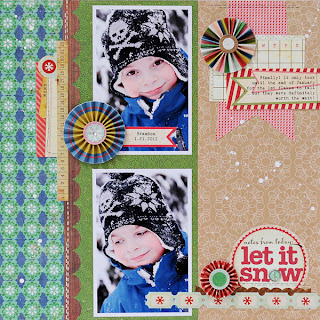 The theme this month in the Garden is winter so I created this loved themed layout with some recent photos of youngest I snapped during our first (and only!) snow fall this winter. I used LOTS of the new Elle's Studio goodies you can now find in the shop on this layout. 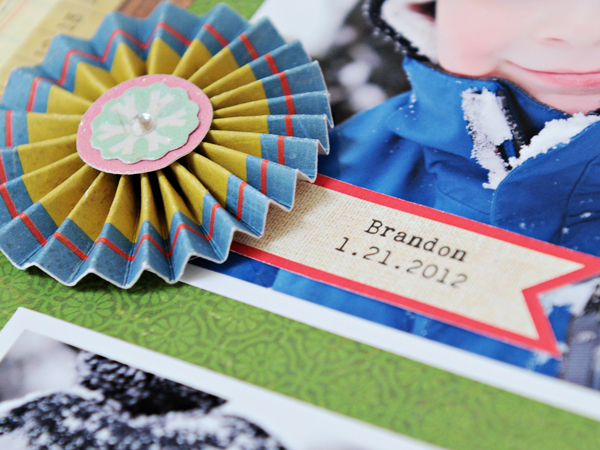 I am such a huge fan of these products - they really add a fun homespun touch that I just love. Plus they have a great matte finish which makes them perfect for printing on with your computer or stamping on with any type of ink (no smudges!). The papers are a mix of Crate Paper (Peppermint collection) and Pebbles (Fresh Goods collection) as well as stickers from Jillibean Soup and spray mist from Studio Calico. For my title I placed the Jillibean Soup stickers on a circle tag from Elle's Studio replacing the "o" in "snow" with a brad from Crate Paper. 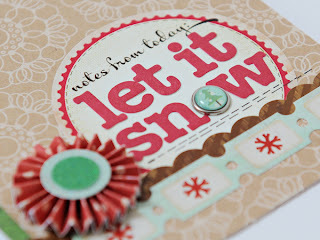 I layered some stickers along the bottom of the circle and added a rosette from Crate Paper as well for some dimension. 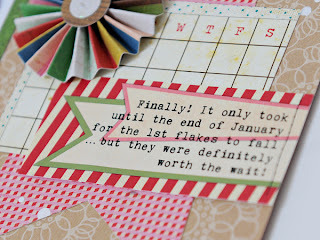 As I mentioned these tags from Elle's Studio have a great matte finish which make them perfect for adding stamping or computer journaling. To add journaling to your tags as I did here simply print your journaling on paper, attach your tag to your paper over the area where your journaling is with temporary adhesive, and run the paper through your printer again. Easy peasy! Such a cute page. I love the rosettes and the color palette. I love these photos of Brandon too. It always fun to see what you do with your fantastic photos. I really like all the fun details to this page--turned out ADORABLE!